Dalton completed 21 of 34 passes for 280 yards with two touchdowns and no interceptions in the Bengals' 37-34 win over the Buccaneers on Sunday. He also rushed three times for 10 yards. Dalton completed 15 of 29 pass attempts for 148 yards, one touchdown and one interception in Sunday's 45-10 loss to the Chiefs. Dalton completed 26 of 42 passes for 229 yards and two touchdowns in Sunday's 28-21 loss to the Steelers. Analysis: Dalton was held to his lowest yardage output of the season, but he still managed to toss multiple scores for the fifth time in six games. With breakout receiver Tyler Boyd -- who caught two touchdowns in this one -- joining A.J. 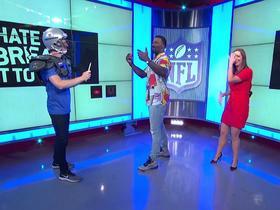 Green on the outside, Dalton should remain a solid pick in two-quarterback leagues for his team's Week 7 matchup with the Titans and beyond. Dalton completed 20 of 30 passes for 248 yards, a touchdown and an interception while rushing for 10 yards on four carries in Sunday's 27-17 win over the Dolphins. Dalton completed 29 of 41 passes for 337 yards, three touchdowns and an interception while adding 13 yards on two carries in Sunday's 37-36 win over Atlanta. Dalton completed 29 of 46 passes for 352 yards, two touchdowns and four interceptions in Sunday's 31-21 loss to Carolina. Dalton completed 24 of 42 passes for 265 yards with four touchdowns and no interceptions in the Bengals' 34-23 win over the Ravens on Thursday. Dalton completed 21 of 28 passes for 243 yards, two touchdowns and an interception while adding two carries for eight yards in Sunday's season-opening, 34-23 win over the Colts. 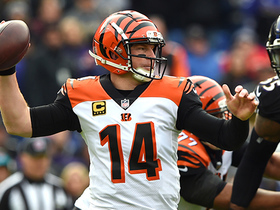 Analysis: Dalton bounced back nicely after getting picked off on his first throw of the season. He connected with John Ross for a three-yard score late in the second quarter, then orchestrated a second-half comeback from a 23-10 deficit, including a 38-yard touchdown pass to A.J. Green. 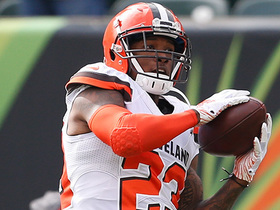 The Dalton-Green connection has long propped up the quarterback's fantasy value, and Ross is starting to emerge as an additional weapon after failing to record a catch in his rookie season. Dalton completed 11 of 16 passes for 180 yards and two touchdowns in Sunday's 26-13 preseason win over the Bills. Dalton completed five of seven pass attempts for 41 yards during Saturday's 21-13 preseason win over the Cowboys. He also gained 13 yards on his lone carry. Dalton anticipates that offensive coordinator Bill Lazor will make significant changes to the playbook and scheme for 2018, Geoff Hobson of the Bengals' official website reports. "When we've changed coordinators in the past, the offense and the scheme and everything has stayed pretty similar," Dalton said. "I think this is going to feel a whole lot different than what we've done and the way we've done things." Dalton completed 23 of 44 passes for 222 yards and three touchdowns in Sunday's 31-27 win over the Ravens. Dalton completed 27 of 41 attempts for 238 yards, one touchdown and one interception during Sunday's 26-17 win over the Lions. Dalton completed 11 of 22 passes for 113 yards and two interceptions without a touchdown or rushing attempt in Sunday's 34-7 loss to the Vikings. Analysis: Dalton was deservedly benched for AJ McCarron with Cincinnati trailing 34-0 in the fourth quarter. The Red Rifle's first interception was taken to the house by Minnesota's defense, and it's fair to question Dalton's job security after consecutive efforts under 150 passing yards. Dalton completed 14 of 29 pass attempts for 141 yards, a touchdown and an interception in Sunday's 33-7 loss to Chicago. 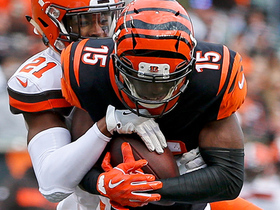 Analysis: The Bengals took a 7-6 lead after Dalton's touchdown pass to Brandon LaFell late in the first quarter, but it was all Bears after that. Dalton missed out on some potential garbage-time stats as he was replaced by AJ McCarron with 4:30 left in the fourth quarter. The TCU product is not a recommended option in another tough matchup at Minnesota in Week 15. 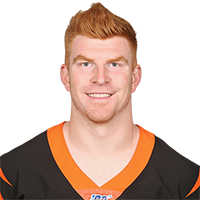 Dalton completed 21 of 36 passes for 234 yards and two touchdowns in Monday night's 23-20 loss to the Steelers. He also rushed twice for 19 yards. Analysis: Dalton found top target A.J. Green for two red-zone touchdowns during the first half, and had a 61-yard score to Green nullified by a holding penalty in the second half. Despite that frustrating play, Dalton still fared well for himself, throwing multiple touchdowns for the fourth straight contest while extending his streak of not throwing an interception to six games. Next up for Dalton is a favorable home matchup against the Bears. 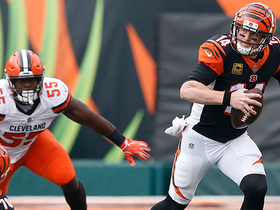 Dalton completed 18 of 28 pass attempts for 214 yards and two touchdowns in Sunday's 30-16 win over the Browns. Analysis: He also rushed four times for 26 yards. The TCU product capped the Bengals' first drive of each half with touchdown passes and extended his interception-less streak to five. Up next is a home tilt with Pittsburgh, against whom he passed for 140 yards and two touchdowns to go with two interceptions in Week 7. Dalton completed 15 of 25 passes for 154 yards and three touchdowns Sunday against the Broncos. He also gained four yards on three carries int he 20-17 win. 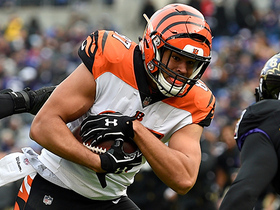 Analysis: Though he averaged just 6.2 yards per attempt, Dalton connected on touchdown passes with three different receivers and went without an interception for the fourth straight game. 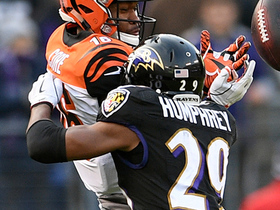 His team deferred to the run after building a lead, suppressing his number of attempts and accompanying yardage. Nonetheless, Dalton's 9:2 TD:INT over the last five games makes him a viable option in Week 12 against the Browns. Dalton completed 20 of 35 passes for 265 yards and two touchdowns while losing two fumbles in Sunday's 24-20 loss to the Titans. 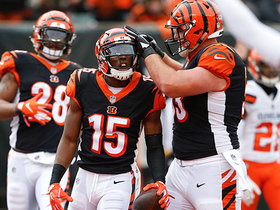 Analysis: Dalton connected with Brandon LaFell for a 37-yard score in the first quarter and added a 70-yard touchdown to A.J. Green in the fourth. The latter touchdown gave Cincinnati a 20-17 lead with 5:03 to play, but Titans quarterback Marcus Mariota was able to orchestrate a late touchdown drive of his own to win the game for the hosts. Dalton's two first-half fumbles were both costly, as the first one led to a Tennessee touchdown and the second came on 1st-and-goal from the nine-yard line. 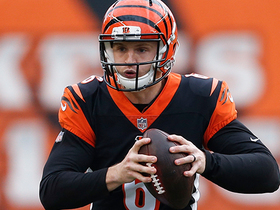 Dalton completed 10 of 18 passes for 136 yards in Sunday's 23-7 loss to the Jaguars. 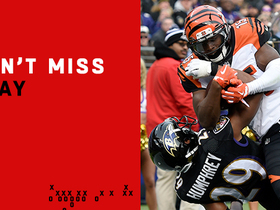 Analysis: Dalton came up against a vaunted Jaguars pass defense and lost his go-to target, A.J. Green, to ejection in the second quarter. Green's ouster from the contest put Dalton in a bind, as he has relied on the Pro Bowl wideout for 35.6 percent of his passing yards this season. Assuming Green is back next week, Dalton is a decent play against a middle-of-the-road Titans pass defense. He's still managed to throw multiple touchdown passes in four of six games coordinated by Bill Lazor.